This data set provides a time series of Landsat Multispectral Scanner (MSS), Thematic Mapper (TM), and Enhanced Thematic Mapper Plus (ETM+) scenes for five (Path/Row) areas in Rondonia, Brazil. The scenes are from the period June 1975 through June 2000, but all areas do not have scenes for all the years. The areas and Landsat Path/Rows included are as follows: Ariquemes (P232,R67), Ji-Parana (P231, R67), Luiza (P231, R68), Cacoal (P230, R68), and Porto Velho (P232, R66). TM images are available for all five areas. Because of a paucity of digital Landsat MSS imagery from the 1970s, only two scenes could be included, a 1975 scene from Ariquemes and a 1978 scene from Ji-Parana. Each of the Landsat scenes has been coregistered to a Path/Row-specific georectified PRODES Landsat file obtained from the Brazilian Government's National Institute for Space Research (INPE) program. For each scene, the coregistration is accurate to within (plus or minus)1 pixel (30-m Landsat resolution) in most places. The five INPE PRODES Landsat scenes used in the georectification process are included with this data set. There are five compressed files (tar.gz format) with this data set. When expanded, each compressed file (which corresponds to one of the five areas) contains a directory for each scene with GeoTIFF files for individual Landsat bands, a text file of tie points, and another text file of slope and intercept values for converting radiance to reflectance. There are two dates for Landsat MSS scenes, 45 dates for TM scenes, and six dates for ETM+ scenes. Figure 1. 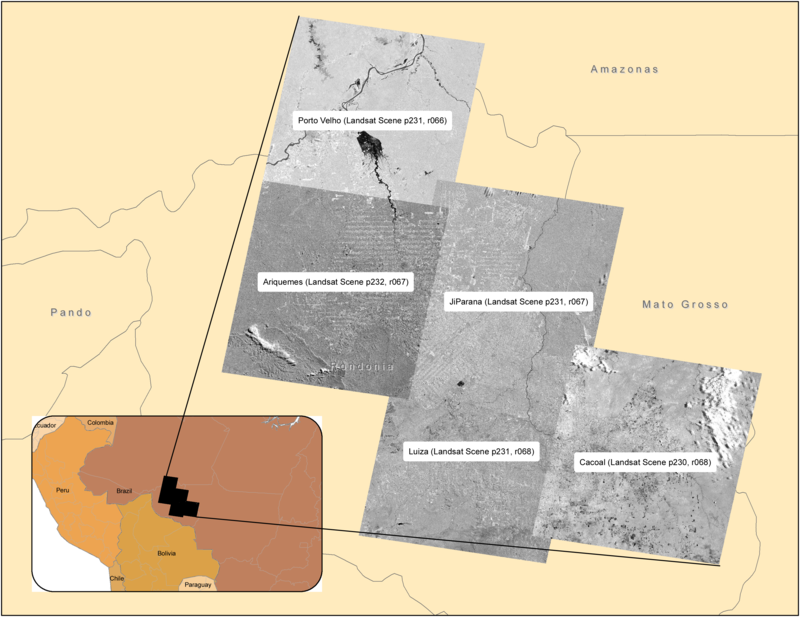 The five Brazilian sites and corresponding Landsat scenes in this data set. This data set was archived in November of 2013. Users who download the data between November 2013 and October 2018 must comply with the LBA Data and Publication Policy. TThe investigators were Chadwick, Oliver A.; Roberts, Dar A.; Batista, Getulio T.; Biggs, Trent W.; Gessler, Paul E.; Holmes, Karen W. and Tomasella, Javier. You may contact Roberts, Dar A. (dar@geog.ucsb.edu). Each of the Landsat scenes has been coregistered to a Path/Row-specific georectified PRODES Landsat file obtained from the Brazilian Government's National Institute for Space Research (INPE) program. For each scene, the coregistration is accurate to within (plus or minus) 1 pixel (30-m Landsat resolution) in most places. There are five compressed files (tar.gz format) with this data set. These files contain directories which correspond to the five Brazilian locations. The locations (with the corresponding Landsat path/row) are labelled as: ariquemes (P232, R67), cacoal (P230, R68), jiparana (P231, R67), luiza (P231, R68), and portovelho (P232, R66). Each Landsat area also includes the INPE PRODES Landsat scene used in the georectification process. There were several acquisition dates for each Landsat scene covering the time period 1975 - 2000. Each date contains several files including GeoTIFFS (.tif), a metadata file for each Landsat band (.xml), a text file of tie points (.pts), and a text file of slope/intercept values (.go). A PRODES folder is included for each area which contains the INPE PRODES base image to which all other scenes for that location were registered. For each Landsat scene there were several acquisition dates, and the files are named with a two letter abbreviation of the site followed by the acqusition date and band number. *.tif -- geotif file for each registered Landsat single band image. There are multiple files of individual Landsat bands per scene designated within the filename by *.b1 - *.b7 respectively. ar000628.b4.reg.tif: a tif file for the Ariquemes location (P232, R67) acquired on June 28, 2000.
ar000628.b5.reg.tif.aux.xml: GeoTIFF metadata file for the arquemes location acquired on June 28, 2000.
ar00to99p.pts: a text file of tie points used to warp the raw image data to a registered PRODES data set. ar000628.go: a text file of slope and intercept values for the linear equation to convert radiance to reflectance. All GeoTIFF files for this dataset have the same basic Spatial Data Properties. The row/column and spatial extent differences are listed below for each of the 5 areas. The spatial reference information is the same for each Landsat scene. - 1999 scene was severely cloud contaminated. - Lower portions of TM3 in 1993 were corrupted. Lower portion of TM3 was estimated by developing a relationship between TM3 and all other bands for the upper half of the image. - Includes Landsat ETM for 1999. - Exact day within August 1978 unknown; August 1 selected arbitrarily. - Collection includes Landsat ETM for 2000. Landsat data were originally obtained from Woods Hole Research Center, Woods Hole, Massachusetts. The data set covers the period 1975/06/19 to 2000/06/28. Temporal Resolution: Multiple scenes are available at every site at erratic intervals. See table provided for dates available for each site. Typical application of the data: These images may be used cartographically, as base data upon which other spatial data layers are displayed. Additionally, the data may be used to derive LULC classifications that may be used to calculate deforestation rates or pattern metrics, as well as to produce change detections. Ariquemes (P232, R67), Ji-Parana (P231, R67), Luiza (P231, R68), Cacoal (P230, R68), and Porto Velho (P232, R66). Because of a paucity of digital Landsat MSS from the 1970s, only two early scenes could be included, a 1975 scene from Ariquemes and a 1978 scene from Ji-Parana. The best temporal coverage was obtained for Ariquemes, which, in addition to a 1975 scene, included fifteen TM scenes, one from 1984, and annual coverage from 1988 to 1999. All Landsat data were coregistered to 1998 or 1999 georectified digital PRODES data supplied by the Instituto Nacional de Pesquisas Espaciais [INPE, 2000]. PRODES is an INPE project which utilizes Landsat data and digital analysis to monitor tropical forest deforestation. The Digital PRODES data were considered by INPE collaborators to have the highest quality spatial accuracy and thus were chosen for a base map. Landsat data were georectified using between 30 and 40 tie points and rubber sheet stretching. All images were resampled using nearest neighbor resampling. Landsat MSS data were originally obtained from Woods Hole Research Center, Woods Hole, Massachusetts. Landsat TM data were obtained from various sources, including INPE. INPE, 2000. Monitoramento da floresta Amazonica Brasileira por satelite 1998-1999, 22 pp., Inst. Nac. de Pesqui. Espaciais, Sao Jose Dos Campos SP, Brazil. Holmes, K.W., D.A. Roberts, S. Sweeney, I. Numata, E. Matricardi, T.W. Biggs, G. Batista, and O.A. Chadwick. (2004) Soil databases and the problem of establishing regional biogeochemical trends. Global Change Biology 10(5):796-814. Roberts, D.A., I. Numata, K. Holmes, G. Batista, T. Krug, A. Monteiro, B. Powell, and O.A. Chadwick. 2002. Large area mapping of land-cover change in Rondonia using multitemporal spectral mixture analysis and decision tree classifiers. Journal of Geophysical Research-Atmospheres 107(D20): Article-8073. Souza, C.M.J., D.A. Roberts, and A.L. Monteiro. 2005. Multitemporal Analysis of Degraded Forests in the Southern Brazilian Amazon. Earth Interactions 9(19):1-25.